In progress ... no title yet. 16" x 20" oil on gessobord. Finally, a Monday I can work in my studio. I was messing around at first because deciding on my next subject to paint was proving rather daunting. So, little things were accomplished. 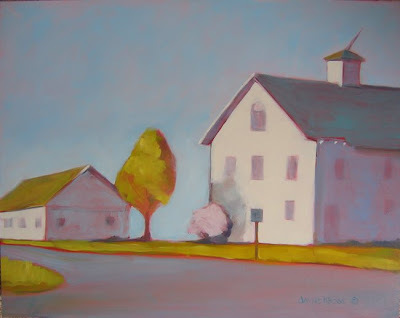 First, the painting below, "Crossroads," was done last week but it didn't feel finished. So I went back in and changed the sky color and hit the lightest lights a bit more. Feeling better about it now...it's a different style for me...an experiment. Then all those paintings that haven't been varnished, got varnished. Maybe that's why I can't sleep...all those fumes. Of course, having a husband fall asleep while watching the basketball game finals last night with the tv going full blast and every light on didn't help. Our bedroom has french doors off that room (small cottage). He came to bed around 2 a.m. and guess who woke up and never went back to sleep? Don't you hate that when that happens? So, at 4 a.m. I just got up, put on a pot of coffee, and decided to update my blog. 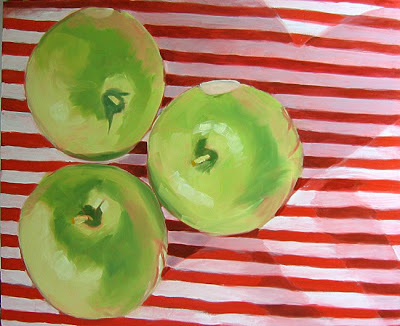 After varnishing 4 paintings, I went through my digital images reserved for future paintings and decided to do the apples at the top of the blog. This photo was actually created for the 3 day workshop with the middle school kids. I think I had 6 photos of different still lifes for those classes. So, this time I decided to do one of these in oil (the classes were in acrylic) and take a bit of time and finish it all the way. This is about 3 hours of work. One more half day should do it. Just got to find that half day.